Futons have in a way revolutionized the manner in which we do sleepovers and in some instances, sleep. That is because futons can have multiple uses depending on the type you get. For the traditional Japanese futons, they can be placed on your bed, sofa, or floor. They can be rolled up and kept in the storage room or cabinet when you will not use them. Hence, they are convenient, easy to set up, and don't take up a lot of space. As such, it is a good alternative to an air mattress that is susceptible to punctures and holes. However, because futons have been Westernized, you will realize that some futons no longer come as a simple mattress, but they already come with frames. Hence, if you have these futons, you no longer have to roll up the mattress or air them out; they can be compared to a sofa bed. If you have a futon without a frame, buying a frame may seem like something that you should not make a huge deal of. That is because some of them can be really expensive depending on the materials that are used to make it. However, to give more comfort to the user, it is always better to consider buying one. Nonetheless, you should carefully select one because the futon might occasionally or permanently be used for sleeping. With that said, if you plan to buy one, read on as this article will review a futon frame which is designed to fit anywhere. Beware of Unauthorized Sellers and Imitations. AUTHENTIC Nirvana Futons is sold exclusively by DCG Stores. The Westfield Futon Frame is a queen-sized product that is made of solid hardwood that gives you a rich finish courtesy of its natural wood grains. It is also available in full size and you can purchase it with or without an expert assembly. With regards to such, it will take you a maximum of three hours to assemble it if you have no prior DIY, assembling, or installing experience. This product can be converted into a lounger, sofa, and bed. As a sofa, it gives you the regular seating height that comes in with your typical sofa, and a dimension of 86" W x 32" D x 36" H. On the other hand, as a bed, its dimensions are of 86" W x 60" D x 24.75" H. The arm, which becomes the head and feet boards have a height of 24/75 inches. This futon though is not so Japanese as it was made in Indonesia. Nonetheless, this futon frame comes with a five-year manufacturer's warranty, so you are covered in the event that something goes wrong. If you buy this product, an additional cost will be incurred as you have to purchase its mattress, covers, and pillows before you use it. The futon's base is a bit uneven, so the mattress may not fit comfortably on the futon. The Westfield Futon Frame is a product that can be effortlessly converted from a bed into a sofa or lounger and vice versa. In addition, this will not look out of place in your room as it has an attractive finish and design. This particular futon has a queen size that can accommodate most futon mattress brands of the same size. Nonetheless, you also have the option to choose the full size being offered by the manufacturer. 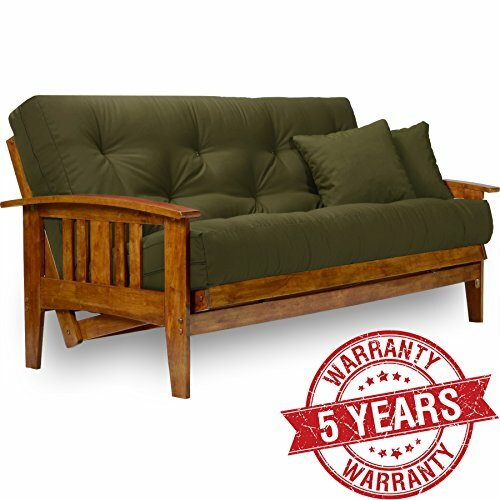 This futon frame comes with a five-year manufacturer warranty and has been constructed using durable and eco-friendly hardwood materials. The manufacturer also made sure that it comes outfitted with an anti-slip mechanism to ensure the safety of older persons and younger children who will sit on it. Despite its perks, before purchasing it, you should be conscious that this is only a frame and you have to spend on the other items that you need to make it a comfortable chair or bed. Likewise, an assembly is required, but you can easily do it yourself. Nevertheless, if you prefer, you can also hire a professional to assist you with getting the job done. You must also keep in mind that this product has a weight limit and the base is somewhat uneven. When you scout for or buy a product, it is always a wise decision to check another brand or model. In this way, you would be able to compare their features, pros, and cons, and eventually determine the one that will surely work best for your needs. 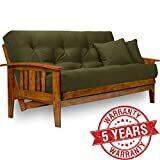 With that said, the Westfield Futon Frame can be compared to the Jerry Sales Futon as they have somewhat similar characteristics. The Jerry Sales Futon can also be converted from a bed to a sofa and vice versa. You can also assemble this with or without the help of an expert. Similarly, it is made of wood and can be upgraded if you want to by painting it or applying varnish. However, the manufacturer did not advertise much information about the type of wood that was used to craft the futon. Also, if you were to purchase this futon, it is a bit more expensive than the Westfield Futon because it comes with an eight-inch spring mattress. This mattress is available in 21 different colors. This product is a bit futuristic in its design in that the manufacturer realized that storage could be an issue and futons should be designed to save space. With that in regard, they included drawers below the futon frame. The Nirvana Futons Westfield Futon Frame is a durable, eco-friendly, space-saving, and easy-to-assemble product that can be used in so many ways. Although it is only sold as a frame, you can get your money's worth as it is suited for all ages as long as the weight limit is met. This is ideal for people living in small apartments and condominiums but is also a great addition to a big home that regularly accommodates guests.